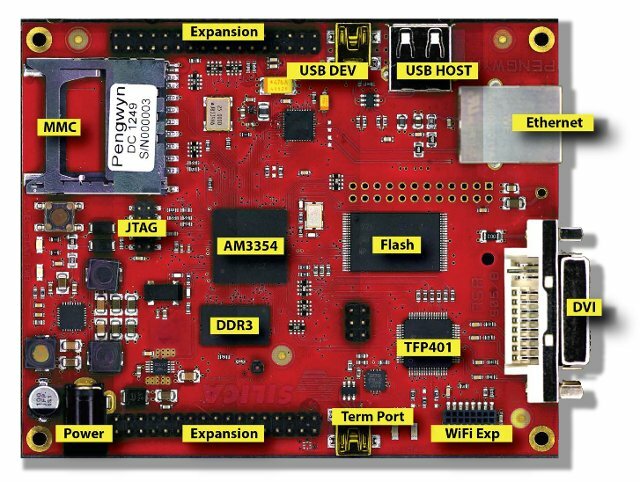 At the end of January, SILICA, an Avnet subsidiary, announced the Pengwyn, a single board computer based on Texas Instruments Sitara AM3354 Cortex A8 processor. The board targets industrial customers, and the company promotes it as “an open platform to develop applications under Linux or Windows Embedded operating systems”. Silica will provide Linux (Arago Project, an OpenEmbedded based Distribution) and Windows Embedded Compact 7 BSP and images, as well as a TI Liunx Ez SDK in a Virtualbox VM. BoM and Schematics are also available for download in PDF format, but I assume they’ll also release the gerber files, and proper schematics (i.e. in original format), since they claim the board can be used as a reference design, and be freely copied. Those boards are said to be plug n play because they can just be plugged into the board, and kernel modules will be loaded at startup, so there’s no setup needed. Compared to the Beaglebone, the company explains Pengwyn targets industrial applications instead of the development community, there’s no issue with third party expansion boards conflicting with each others, Pengwyn uses cheaper DDR3 (vs DDR2 for Beaglebone), and power supply design is simpler since there is no need to handle deep sleep mode in industrial applications. Pengwyn and modules will be available at SILICA and Avnet Express in Q1 2013. The board will be priced at 69 Euros. You can find more information on SILICA Pengwyn page.